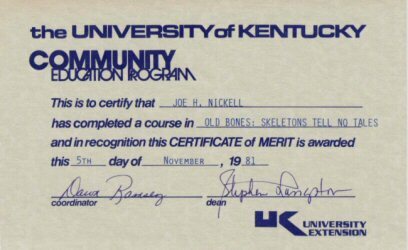 In October 1981, while a student of forensic anthropologist Dr. David Wolf (in a community education course at the University of Kentucky), I assisted in a forensic dig at a site in Georgetown, Kentucky, where volunteers uncovered human remains. Primarily, I made the gridded-site drawing as others in our class and anthropology students under Dr. Wolf's direction unearthed a woman's skull and bones and later a possibly associated bullet. 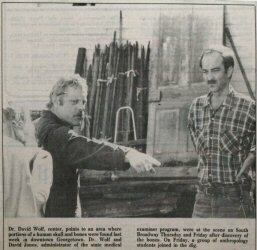 (See "Renovation work slowed after skull, bones found," Georgetown News and Times, November 5, 1981.) See also Archeology Worker.